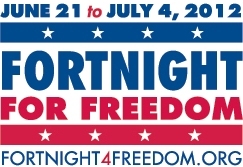 I wanted to remind you all about the special diocesan-wide Fortnight for Freedom event, which we have helped the diocese organize. It is this Saturday evening, June 30, at St. Rita, beginning with the 5:30 p.m. Vigil Mass, followed by a free dinner program from 6:30-7:30 p.m. The details are below. Several Catholic organizations, including the Knights, GRN, Catholic Charities, Birth Choice and White Rose, are helping promote and support this important event. I hope you all will be able to attend to show our unified support of this historic campaign for religious liberty (except of course for Jacquelyn and Paul who will be leading our youth at Boot Camp – we are praying for you!). And a very special thank you to our Board Member Mike Cole and i Fratelli for providing the pizza dinner! ** We do have a special need for help, if any of you are coming for the program only – we need to pick up the pizzas from two i Fratellis, one in Plano on 2208 Dallas Pkwy just north of Park Blvd, and the other in Dallas at 6109 Greenville Ave just south of Caruth Haven near Central (this location will also have the salad). We want the pizzas to be "hot and ready" when Mass ends at 6:30, so the pickup times are just before 6 p.m. If you are somewhat near either of these i Fratelli locations and could help with pickup, please email me at kgarnett@prolifedallas.org. Thank you! All are invited to a special Fortnight for Freedom event sponsored by the Diocese of Dallas. The evening will begin with the 5:30 p.m. Vigil Mass at St. Rita, 12521 Inwood Rd, Dallas, with celebrant and homilist Monsignor Robert Coerver, V.F., followed by a free dinner program in Sweeney Hall, presented by Frank Valenzuela of the St. Thomas More Society, the Catholic Lawyers’ Guild of the Diocese of Dallas, and closing with the Litany for Liberty (USCCB).